With hundreds of thousands of dollars worth of entertainment for only $5 (children under 10 are free), there are endless things to do this Cherry Blossom weekend. Everyday from10:00 am-10:00 pm, visitors and guests can enjoy free parking as well as free shuttle rides provided by the Macon Transit Authority at designated locations. 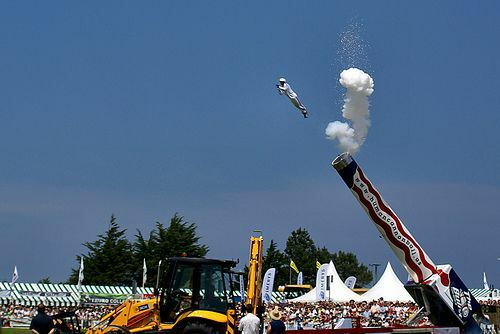 David “The Bullet” Smith has been a human cannonball for over 11 years and has performed more than 5,000 cannon shots around the world. He is the highest flying Human Cannonball in the world today with his record breaking human cannonball shots and dynamic personality. As a producer of family shows for over two decades, Scott’s show features futuristic elements including two performers, neon lights, lasers, and a live robot that can be seen “floating in air.” This show is sure to capture the attention & imagination of kids ages 2 to 92! Along with his stage show comes a comedy roving act, making it a “production on wheels.” This show recently headlined The South Florida Fair for their 100th Anniversary. The show has also appeared at the Illinois State Fair, Alabama National Fair, and the Miami Dade County Expo. Carrie is no ordinary stilt walker! Not only does she wield them like they are her own legs, she also juggles, dances, and creates an atmosphere of fun and excitement for all ages! You won’t want to miss this strolling act that has performed at the North Carolina State Fair, South Carolina State Fair, and Nebraska State Fair. The Kidz Science Safari is a mobile, fully interactive, traveling children’s museum indoor activity. It features at least 14 “hands-on” science based educational exhibits that appeal especially to children in grades K-6th. This exhibit is based on STEM (science, technology, engineering and math) and combines learning with fun for all ages. This is a self-guided exhibit that will remain open all day (10am-10pm) and is located inside the round building. The Nerveless Nocks are descendants of the Swiss Circus Family Nock and are among the most respected aerial stunt artists in the world today. Since 1954, The Nerveless Nocks have been thrilling audiences across the United States, Canada, Mexico, and world-wide. This fully produced arena show has been seen at the Ohio State Fair, California State Fair, and Texas State Fair, just to name a few. They have also been voted into the Best 100 in Entertainment Circus by Time Magazine and CNN. Worldwide performances by this talented family also include stops in Japan, Thailand, New Zealand, and Germany.